This past Monday, I featured this card on the Sweet 'n Sassy Stamps blog and meant to post it on my blog as well- oops!! 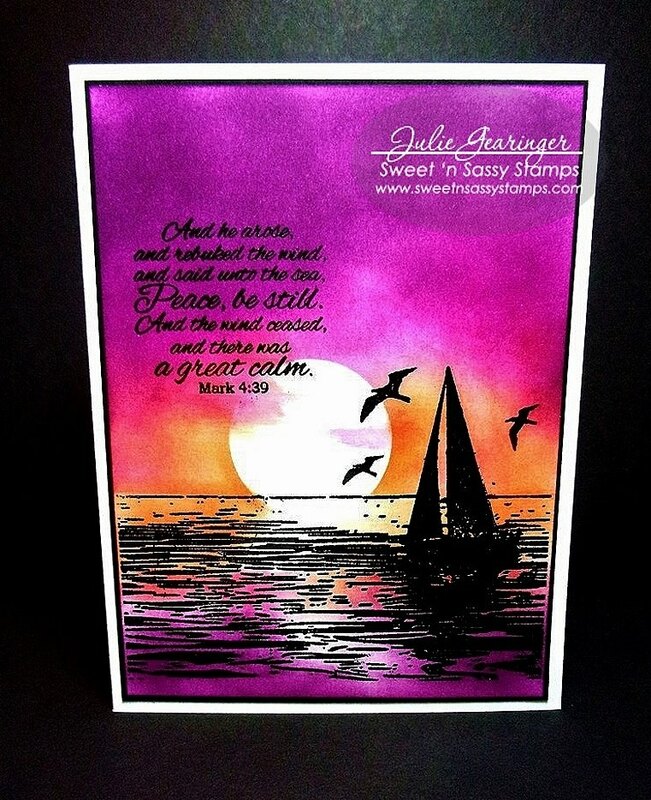 Sweet 'n Sassy Stamps (SNSS) The Sea is a wonderful stamp set with this gorgeous ocean scene and several verses and sentiments- perfect for masculine or feminine cards! Stamp the ocean scene from The Sea (SNSS) using embossing ink, apply black embossing powder and heat set. Create a mask with a circle punch and sponge various colors onto the sky and water (I used Pumpkin Pie, Melon Mambo and Rich Razzleberry). Ink and stamp the verse from the stamp set using embossing ink, heat set with black embossing powder, trim and mount onto black cardstock, trim and mount onto the white card base to finish off the card. My husband and I live in Maryland and we are about to celebrate our 33rd Anniversary in January. We do not have any children of our own, but love working with 3rd thru 6th grade kids in our church’s Awana program and have done so now for 18 years. We have always had “kitties” in the house and over the years have had two groups of three- four are in “Kitty Heaven” and two that are still with us ( our “girls” are almost 10 years old, Angel and Queenie). I have always been artistic and ever since I was a young girl had a pencil with paper in my hands drawing or coloring! I was introduced to stamping in 1999 and loved the idea of being able to show others how they could be artistic as well! I have been blessed with a very supportive husband and am currently on several Design Teams. How long have you been a fan of Sweet 'n Sassy Stamps? I believe I have been a fan since the beginning and a customer for at least five years or more! I love all of the beautiful images, Christian sentiments and verses! It has been a delight to get to know Korin as well as the Design Divas on the team. What do you enjoy outside of stamping? I enjoy spending time with my husband and we love to take day trips to the mountains and enjoy God’s beautiful creation! I love doing all types of arts and crafts as well as sewing and, of course, enjoy reading and studying the Bible (have also starting to do some Bible Art Journaling). What is your "day" job? As the others have said, that is a hard question! So much inspiration is all around us as well as online- I tend to draw inspiration from nature, viewing online galleries such as Splitcoaststampers and I especially love to participate in online challenges- sketches, color combinations, themes, etc. I truly believe that the Lord has gifted us all in various ways and am so thankful that He has allowed me to share that gift of art with others. Share a fun or interesting fact about yourself that most people might not know. My husband and I met on a “blind date” and have been inseparable ever since! What advice would you give to a new stamper? Do not compare yourself with others- it takes time to develop techniques and skills. Join stamping groups like Splitcoaststampers (which is free) and check out the galleries, try a few challenges and of course, check out the tutorials. YouTube has so many videos and Pinterest is another source of inspiration for sure!! Remember to have fun and do not compare yourself with others- it takes time to develop techniques and skills. What is your favorite SNSS set? Well, I hope you have enjoyed these cards and our “Getting to Know You” segments- have a blessed week, sweet friends!